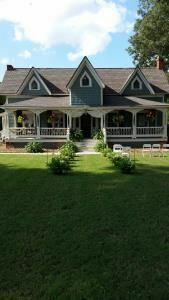 Forest Hill Park is a privately owned wedding and event venue located right off Main Street going east out of Perry, Georgia. Its beautiful scenery and unique features make it ideal for weddings, birthday parties, family reunions, company parties, and more! Some of the parks charming qualities include the Brian Bowen Bridge, the historic First Baptist Church of Perry steeple, the Red Caboose, and our newest edition, the picturesque Clinchfield Chapel. For more information on booking this beautiful location for your next event please contact us.